Ka’anapali Beach is nestled between historic Lahaina town and the well-renowned resort area of Kapalua. Ka’anapali is Hawaiian for “rolling cliffs” which is evident when you first experience the marine preserve and snorkeler’s paradise at Black Rock, which separates Ka’anapali’s north and south beaches. Hula Grill Ka’anapali is located in the heart of Ka’anapali’s south beach, also known as, “Dig-Me Beach.” This three-mile stretch of magical white sand is literally where Hawaii’s aliʻi (royalty) came to surf, paddle and play traditional Hawaiian games. The tradition of visiting Ka’anapali to play in its pristine tropical waters and continue your adventure along its breathtaking coastline is still alive and well today. It doesn’t matter if you’re a first-time visitor or you live five minutes away, when you step foot in Ka’anapali, you are officially on vacation. Ka’anapali has won multiple awards for ‘Best Beach on Maui’, and even for ‘Best Beach in America‘. It serves as an epicenter for watersport activities including surfing, snorkeling, scuba diving, jet skiing, parasailing, whale watching and much more. On land, Ka’anapali boasts a 36-hole golf course, shuttles to Kapalua and Honolua Bay, some of the finest resort living in the world and of course Whalers Village. The gateway to Whalers Village from the makai (ocean) side is Hula Grill Ka’anapali and our sister restaurant Leilani’s on the Beach. 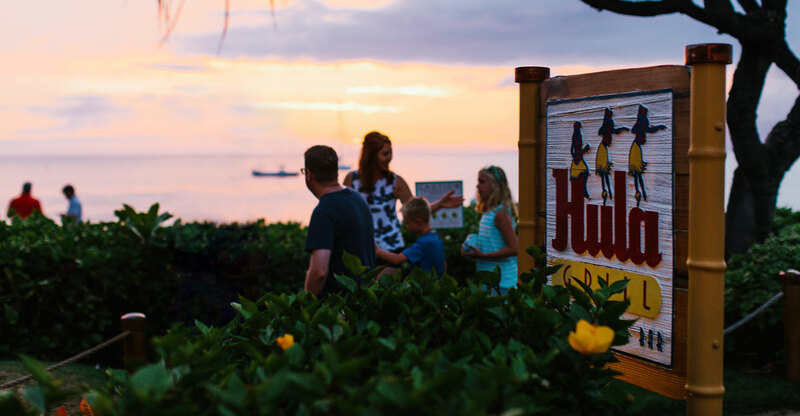 After a beach day full of adventure or pure relaxation, there’s no better place to feel at home and enjoy live Hula with chef driven creations than at Hula Grill Ka’anapali.